The RJ Group is recognized as one of northwest Washington’s top real estate developers. Our projects include townhomes, single-family homes, apartments, commercial properties and land development. Single family and multi family housing development in Bellingham. Three Projects - One Harmonious Neighborhood. Set among 45 acres of protected green space, Trio offers three new and distinct Bellingham home collections at accessible price points: The Cottages, The Meadows, The Commons. TRIO|Meadows - Phase II is currently under construction and expected to be completed this summer. Spread out across 30 acres, the pedestrian-friendly Aurora Court neighborhood will feature 330 single-family townhomes developed utilizing Bellingham’s Infill Toolkit. To appeal to a wide market, the homes will offer a diversity of floor plans and architectural styles, and will average in size from approximately 1,200 to 1,700 square feet. In addition, the homes will feature alley-load designs for an inviting streetscape. The neighborhood will encourage interaction among residents through the incorporation of pocket parks, rain gardens and walking trails. A larger neighborhood park is being designed for the development’s northwest corner and will serve as a community gathering space that links the trails and smaller parks together. Phasing and site design has been carefully planned to allow for optimal exposure to the open space. Mahogany Manor will feature 130 apartment units and 4 apartment townhomes in a brand-new neighborhood in Cordata. The main building will include tall ceilings, spacious units and a common area that features a lounge, indoor dog wash, fitness center, secured bicycle storage, and on-site secured storage units. Each unit has a full appliance package, a private deck or patio and modern finishes. Pacific Place is an 9.4-acre flexible zoning, industrial property located in Cordata – Bellingham's fastest growing neighborhood. Thanks to it's strategic positioning, Pacific Place is well-positioned to draw customers from the adjacent Costco warehouse, as well as other popular, destination retailers along the nearby W. Bakerview Road commercial corridor. 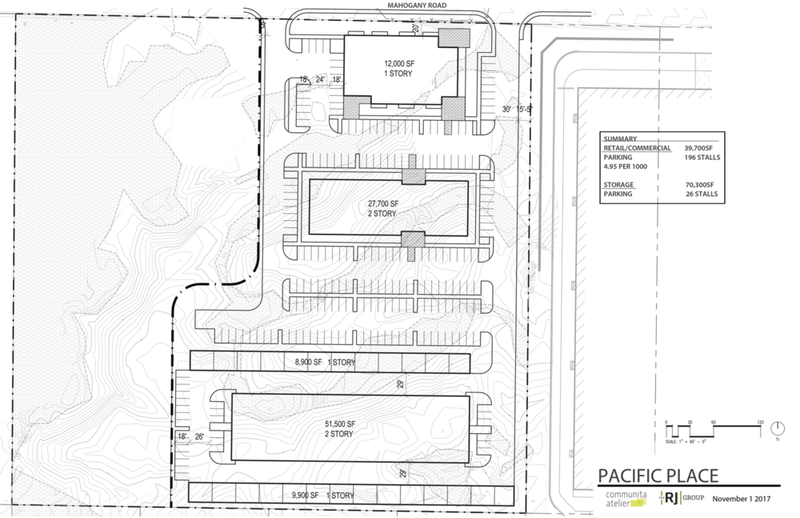 Adding to its visibility, Pacific Place will front to Mahogany Avenue where 440 new housing units are planned to be built directly across the street. The site's proximity to I-5 access (0.6 miles) and Bellingham International Airport terminal (2.0 miles) makes Pacific Place an ideal distribution point. Current plans for this 9.4 acre flexible zoning use property include a 5.8 acre commercial/retail development fronting Mahogany Avenue and backed by industrial/warehouse space, as well as nearly 3.6 acres of preserved wetlands. Galbraith Tree Farm is a 2,240 acre timberland near Bellingham, WA on the northwest section of North Lookout Mountain, also known as Galbraith Mountain. The RJ Group's role is to act as Galbraith Tree Farm, LLC's representative for “big picture” enhancement projects currently being explored for the property and its 45+ mile trail system. Day-to-day operations of the tree farm are managed Janicki Logging and Construction, which has been working the timberlands since 2010. 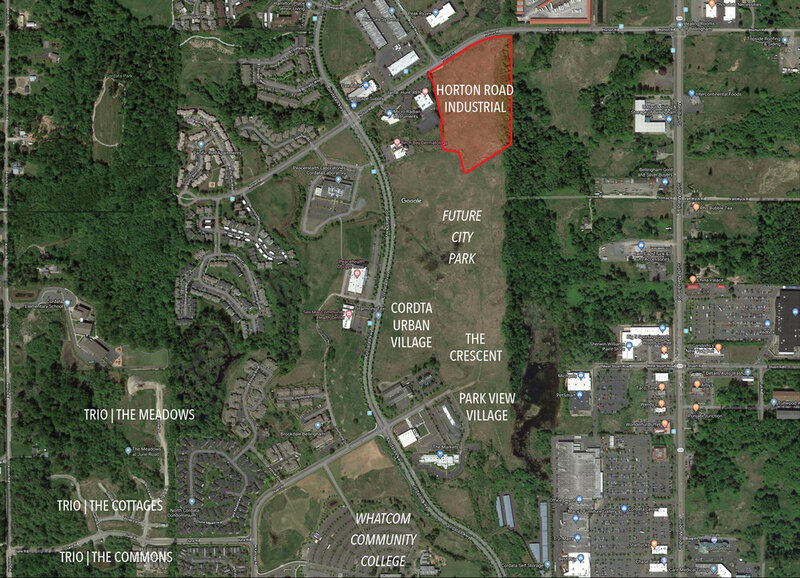 Horton Road Industrial is an assemblage of five Light Industrial zoned parcels, totaling approximately 8 acres of developable land located in Cordata - Bellingham’s fastest growing neighborhood. The property is adjacent to existing road infrastructure to the north where all utilities are available and frontage improvements on Horton Road are in place, reducing future development costs. The Horton Road Industrial site's easy import/export access to the Canadian border (14 mi), Interstate-5 (2 mi), and Bellingham International Airport (3 mi) are ideally suited for today's rapidly growing e-commerce business sector. The south portion of the site includes 2.5 acres of open space, providing a natural buffer between the developable area and the Cordata Community Park now slated for completion in Oct., 2019. Moreover, Horton Road Industrial's light industrial use zoning nicely complements the neighborhood’s surrounding “live-work-play” uses, including several other nearby RJ Group projects expected to add hundreds new housing units to the surrounding neighborhood. Gateway Village consists of 52, three-story, live-work townhomes. The project is located southeast of downtown Sedro-Woolley near Highway 20 and Cook Road, with easy access to I-5 and two expansive recreation areas - The San Juan Islands to the east, and The North Cascades to the west. The pedestrian-friendly neighborhood will have two community parks, a welcoming plaza with trellises and street parking for guests. The two- and three-bedroom, urban-styled townhomes will feature lower level office space with separate entrances for in-home businesses. In addition, the homes feature two-car garages, two bedrooms on the upper level and an open design on the main level. Some of the homes will also include second-story patios to extend the living space outdoors. Future phases are scheduled to include commercial space, adding to the village-like feel and walkability of the community. State Street Creamery is a planned commercial-residential development located in downtown Bellingham. This extremely desirable in-town location is roughly halfway between the core of the Downtown District, 0.5 miles to the north, and Western Washington University, 0.5 miles to the south. The site is very close to numerous shopping, dining, and entertainment venues with a Zillow Walk Score of 84 (very walkable). In addition, State Street Creamery is within 0.3 miles of 10 different bus lines. This vital location is ideally suited for Bellingham’s “college town” demographic of university students, faculty, and aspiring young professionals. The State Street Creamery project is currently being envisioned as two, 6-story buildings and one 4-story building with a total of 150+ apartment units plus retail/office spaces along State Street. Many of the uppermost apartments are expected to have views of Bellingham Bay. The project would also include underground and multi-level parking accessible from Berry Street and Forest Street.